When it comes to timeless glamour, this combo of a green-yellow blazer and black wide leg pants doesn't disappoint. Let your styling chops really shine by rounding off your look with burgundy suede high top sneakers. 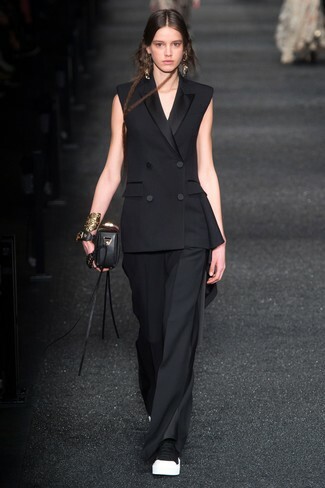 We give a big thumbs up to this casual pairing of a black sleeveless blazer and Josie Natori black wide leg pants! Rev up your whole ensemble by rounding off with a pair of black and white canvas high top sneakers. This pairing of a light blue off shoulder top and Josie Natori High Waisted Palazzo Pants is very easy to throw together and so comfortable to rock a version of over the course of the day as well! For a more relaxed vibe, introduce a pair of black leather flat sandals to this look. A light violet fur coat and Josie Natori High Waisted Palazzo Pants are among the unshakeable foundations of an elegant wardrobe. When it comes to shoes, this getup pairs perfectly with black suede ankle boots. Why not pair a white and black fringe kimono with black wide leg pants? As well as very comfy, these items look great matched together. A pair of black leather gladiator sandals can instantly play down an all-too-refined outfit. 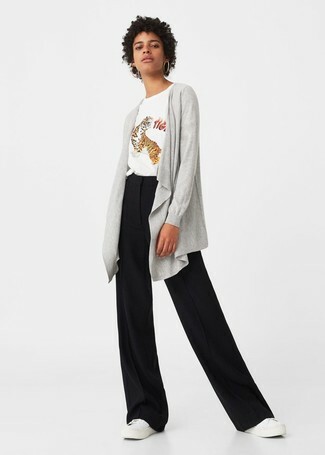 Such staples as a grey open cardigan and black wide leg pants are an easy way to introduce extra cool into your casual arsenal. White leather low top sneakers will add a dose of stylish effortlessness to an otherwise all-too-safe look. 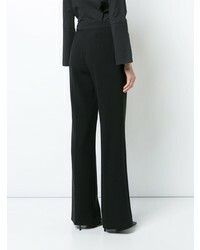 A white cropped top looks especially good when worn with Josie Natori black wide leg pants. 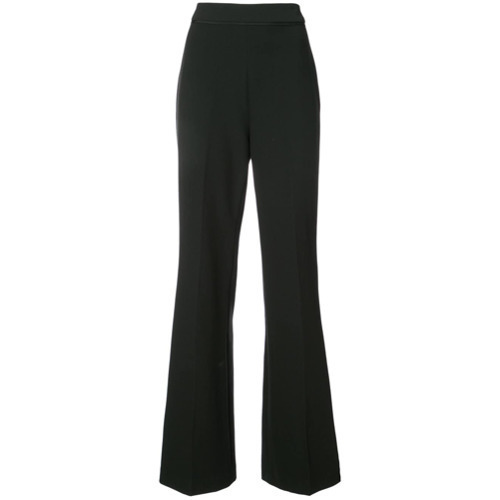 A black coat and Josie Natori High Waisted Palazzo Pants are a good combination that will get you a great deal of attention. Black leather chelsea boots will bring a playful touch to this look. This relaxed casual pairing of a red leather biker jacket and Josie Natori High Waisted Palazzo Pants from farfetch.com is very easy to pull together in no time flat, helping you look chic and prepared for anything without spending too much time combing through your closet. Finish off this getup with black leather ankle boots to serve a little outfit-mixing magic.